Now that the Gallipoli landing centennial commemorations and the ANZAC remembrance services are over perhaps we can examine the flag issue without letting emotion cloud our conversation. Flags have never held much interest for me; I’ve never quite understood their purpose. In the digital age with instant worldwide communications between nations at the touch of a computer key a printed piece cloth must surely be approaching its use-by date. Flags can often imbue a form of nationalism that is quite unpalatable. I remember visiting Belfast in Northern Ireland some years ago and being dismayed at seeing the Union Jack being flown from the homes of the pro-British Protestants to rile the Irish Catholics. The Americans hold their flag in a curiously high regard, referring to it as “Old Glory” and even naming their national anthem after their star spangled banner. But I’m not sure I can buy the RSA claim that our men fought under the existing flag therefore it must be preserved. I don’t recall any of our soldiers marching as to war, with the flag of New Zealand going on before. To borrow a phrase. 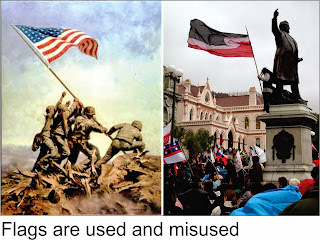 I actually looked in Google Images for a photo of New Zealanders going to war under the flag. There were none. 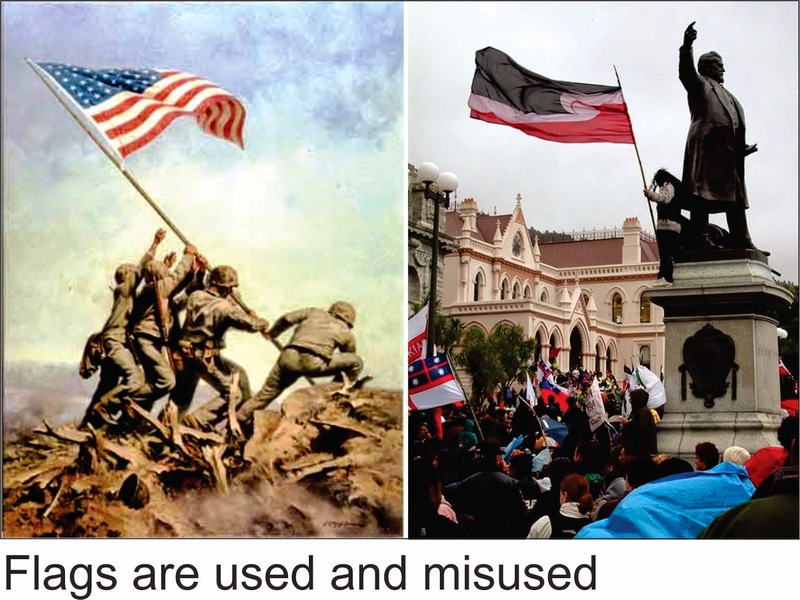 I seem to recall portraits of flag-bearing warriors in the American civil war and some dedicated soldier must have been carrying the stars and stripes when they took over the Japanese island of Iwo Jima in 1945. There will have been many reasons why our young men went to fight a war on the other side of the world. Adventure, a trip out of New Zealand, conscription, or maybe even a genuine belief that democracy was worth preserving and fighting for. I doubt that a flag with a Union Jack in the top left-hand corner was ever part of their thought processes. However a flag-draped coffin of a returned serviceman does remind us of the sacrifices made and I accept this is a tradition we would be loath to let go. Recently we have seen the disturbing film clips of the dastardly Isis thugs marching behind a black flag bearing white Arabic writing. This put paid to John Key’s original thought of a potential new New Zealand flag having a silver fern on a black background. The Maori separatists have their own distinctive flag and this was flown when their Hikoi marched on parliament to protest Helen Clark’s eminently sensible foreshore and seabed legislation in 2004. The marchers set out from Northland and I vividly recall the angry young Maori men marching through our main street many wearing balaclavas or bandannas that hid their faces carrying the flag before them. The ten member committee the government has put in place to whittle down options for us to vote on makes good sense if you are open to change. If you want the status quo you would have wished that we had the referendum on whether you wanted a new flag or not to come first. But putting together a cross section of highly-regarded New Zealanders to decide on a selection for us to vote on from the hundreds of designs so far submitted makes good sense. It’s no good voting on whether you want a flag change or not if you don’t know what your real options are. The whole process is costly of course, but those who say we should be outlaying the money on hip-operations, stomach bypasses or child poverty would have to concede that this could equally apply to any government spending that is not categorised under health and welfare. Republicanism is looking less and less appealing when you see the dynastic system that seems to have engulfed America. Despite having an eye-watering population of more than 300 million, if you’re not a Kennedy, a Clinton or a Bush your chances of occupying the oval office are remarkably slim. And so I’ll stick with the monarchy; Harry showed us recently that they’re not a bad bunch. But we don’t depend on Great Britain any more for trade and our own ethnic make-up is looking more Asian by the day. We’ve done our penance to the old country, perhaps it’s time to assert our independence and get ourselves a brand spanking new twenty-first century flag. Totally unwarranted though flags are.